Enjoy the pleasures of relaxation for your honeymoon at a Junior suite located on the 20th floor, offering luxurious rooms with a Thai Contemporary style with a clean modern design that meets a warm and friendly ambience. 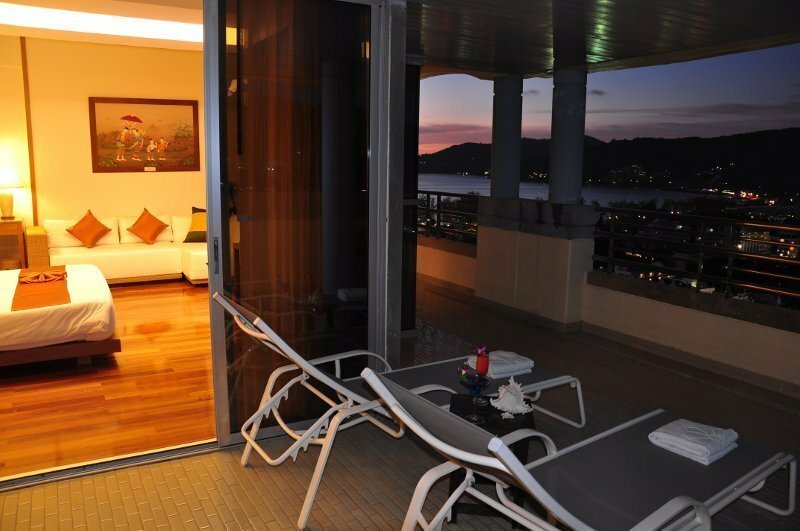 The private outdoor terrace has panoramic views of Patong Bay. Relax with the ‘Lover Lovers’ spa package for 2.5 hours and enjoy a romantic candle light sunset dinner with sparkling wine, while overlooking the Patong Bay with a panoramic view on the 25th floor at ‘The Royal Kitchen’. Room guarantee for a high floor with sea views. Daily Buffet Breakfast at Coconut Coffee shop or Breakfast served in room. Honeymoon flower set-up in room. 1 Romantic candle light sunset dinner with 1 bottle of sparkling wine at ‘The Royal Kitchen’ on the 25th floor. ‘Lover Lovers’ Spa package 2.5 hours. Compulsory Gala Dinner on 24 Dec 2010: Adult 1900 Baht/person Child 950 Baht/person. 31 Dec 2010 Adult 3500 Baht/person Child 1750 Baht/person. Enjoy the pleasures of relaxation for your honeymoon on the 19-20th floors facing the sea views – the breathtaking panoramic views it has to offer are enhanced at dusk, when the sun sets in the sea. Relaxation with the ‘Lover Lovers’ spa package for 2.5 hours and enjoy a romantic candle light sunset dinner with sparkling wine while overlooking the Patong Bay with a panoramic view on the 25th floor at ‘The Royal Kitchen’. 1 Romantic candle light sunset dinner with 1 bottle of sparkling wine at the Royal Kitchen on the 25th floor. Compulsory Gala Dinner on 24 Dec 2010 Adult 1900 Baht/person Child 950 Baht/person. 31 Dec 2010 Adult 3500 Baht/person Child 1750 Baht/person. Man you are a legend. SICK blog!! !